First Listen: Pallbearer, 'Sorrow And Extinction' The Little Rock doom-metal band demonstrates just how majestic pain can sound on its debut album. Pallbearer demonstrates just how majestic pain can be on its debut album, Sorrow and Extinction, out Feb. 21. Sometimes, sadness is just too heavy to bear. 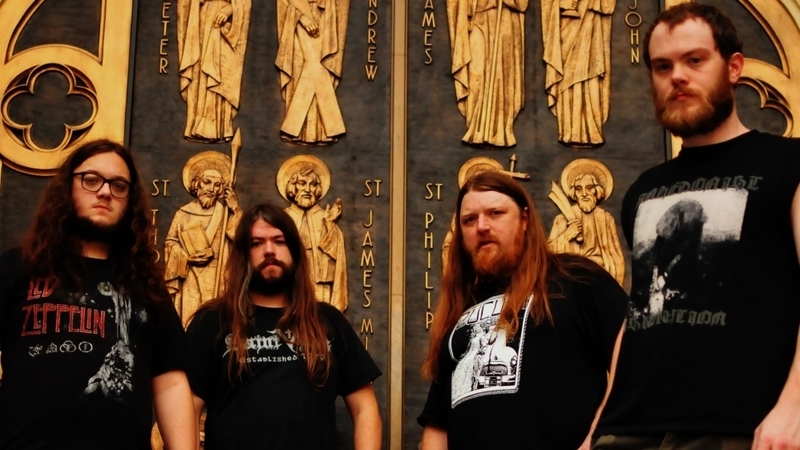 At the end of Pallbearer's promising 2010 demo — which you can download for free, by the way — the doom-metal band covered not Black Sabbath, but perhaps what should be considered the proto-doom anthem, "Gloomy Sunday." Most famously, the 1930s Hungarian suicide song was sung by Billie Holiday in 1941; with a similar but decibel-intensive blow, Pallbearer demonstrates just how majestic pain can sound. That emotional weight is carried throughout Pallbearer's heavily anticipated debut album, Sorrow and Extinction, out Feb. 21. Pallbearer's appreciation of the genre's lineage explains why doom traditionalists flocked to the Little Rock band in the first place, but Sorrow and Extinction is no mere revival. Brett Campbell's impassioned vocal delivery calls to mind Candlemass' Robert Lowe, the slow and heavy riffs are drawn from the Warning songbook, and mighty drummer Zach Stine can swing like Black Sabbath's Bill Ward when not hitting a crucial cymbal or taking a skillful pause to let the atmosphere hover like English fog. But a long list of mouth-watering influences isn't enough to make a memorable album. What makes Pallbearer matter in the increasing glut of heavier-than-thou doom-metal bands is these four Southerners' conviction. These are songs that challenge the doom gods themselves for a place on the throne. Take the 12-minute opener. "Foreigner" spends two minutes establishing a sparse, mournful melody on an acoustic guitar; it practically throbs from inconsolable sorrow. It's a naked portrait, eased — not pummeled — into riffs wearing anvils. Yes, it's all low and slow, and it could make the happiest of the go-lucky doubt his life's work, but as the album unfolds, the beauty lies in the details. The album's centerpiece, "The Legend," is particularly headphone-worthy. At the 1:40 mark, there's a brief-yet-crucial seconds-long flourish of feedback before an unfathomable lunge, as well as a careful, almost proggy minor-key guitar interplay that briefly intertwines as one key riff ends and another begins. The way Campbell sings, "As I start to slip away / I know my time has come" is truly heartbreaking — I've not heard a metal vocal performance of this depth and universality since Patrick Walker (Warning, 40 Watt Sun) made heshers realize that sadness is undeniably metal. Sorrow and Extinction closes on what seems to be a look-ahead. Graced by dreamy keyboards and synthetic choir voices, I feared that Pallbearer had gone Goth, but "Given to the Grave" collapses and reshapes doom metal as it progresses. The quietly foreboding clean guitar and sparse drums point to Pallbearer's comrade in bleakness, Loss, as the first plunge into sludgier territory offers a deafening wink to Pallbearer's fellow Little Rockers in Rwake. And as one guitar holds down melodic variations, the other solos its way into hell, greeted by a demonic choir. It's order descending into chaos, and Pallbearer is our guide.